Painted in blue, Kelingking Beach is one of the most popular beaches in Bali. While the beach is just gorgeous, even the track leading to the beach is simply extraordinary. Shaped in the form of T-Rex, the view point along the way to the beach will keep you occupied and is also a great destination to soak in the views of a crimson-filled sunset. Take a splurge into the pristine waters of the beach, laze around the silky sands, and get a tan under the sun. If you are looking for a wonderful scenery to get the best of Bali, Kelingking Beach is totally for you. How popular is Kelingking Beach? People normally club together Nusa Penida Island and Broken Bay while planning their visit to Kelingking Beach. Absolutely beautiful beach from both the top and when you get down to the bottom. If you are going to make the hike down bring the right shoes. If you're wearing sandals be prepared to walk up Barefoot, and walking up is quite the Endeavor. If it has been raining recently then it will be slippery, there are sturdy handrails but if you do not often go on strenuous hikes this will be a challenge for you. The bottom is amazing though, there is a little shop that sells water if you need it, the sand is very soft and bright white, the water is absolutely beautiful and about 80°F. It's extremely hot, wear your sunscreen! Great place to spend your day. YOU NEED TO EXPERIENCE THIS!!! It is like a movie, any shot with the phone, camera, drone or anything will be perfect because this place is perfect. Just a few minutes away from main harbor and easy to do on your own motorcycle. $5.000 Rp per person. Just be careful if you want to go down it is a long and steep way. Beach down there is beautiful but really strong waves. Enjoy it!!! One of the most beautiful places in the world. White sand, blue water, when you think of “holiday paradise” this is it. Only issue is the way there - the steps are very dangerous & you need to be so careful. Walk is around 45 minute each way. I’d recommend wearing good shoes, carrying water & sun lotion and try to avoid travelling there/back in hottest part of day as you’ll struggle on the way back up. 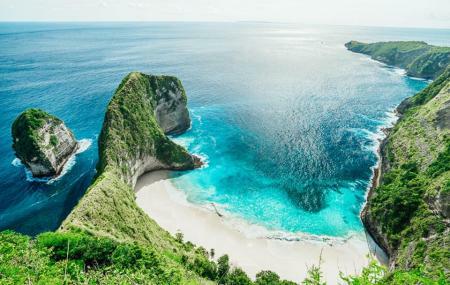 If you are an avid hiker looking for some challenge in Nusa Penida, this is your hike. Don't get any opinions from just the photos. No words can describe the majestic beauty that you will experience in person. No matter which part of the world you are from, this will strike you with Awe at first sight. It's best to experience the place during sunset. If you hike down, you'll get rewarded with an equally amazing Beach. Please plan to spend a day if you wanna enjoy the fullest.